Perfect Tie for Weddings, Parties, Office and any casual events. Alternate tie blade widths, matching bow ties, cravats, waistcoats, cufflinks, accessories and boys’ sizes are all available. Express your unique personality with one of our DQT men’s premium satin plain solid classic standard 9cm tie and handkerchief sets, ideal for casual or formal events such as proms, dances and other special occasions. The pocket square has become really popular within male fashion recently, so why not tie your wedding in with the recent trends and choose a wedding tie and handkerchief set for your big day. These classic tie and handkerchief set aren’t just for weddings though they are an easy way of purchasing a selection of accessories and neckwear to add some life into your wardrobe as they’re not all wedding themed! Getting a pocket square on point is a key element of rocking this look. Mixing and Matching the Plain Standard Tie and Handkerchief will make you look dazzling, awesome and amazing! Plain men’s accessories are perfect for adding a splash of pattern into your plain suit for the office or some personality to your wedding party. Plain bow ties are simplistic but classy it is best to match the accessory with a bow tie to bring some extra style into your casual look. 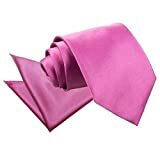 DQT’s plain regular 9cm tie and handkerchief set are really high quality and really affordable, inject some life into your work or wedding wardrobe today.